This is our official team photo. Kevin (on the left) was our pilot. The couple on the right were wonderfully supportive. According to The Hitchhiker’s Guide to the Galaxy, 42 is “the meaning of life, the universe, and everything”. 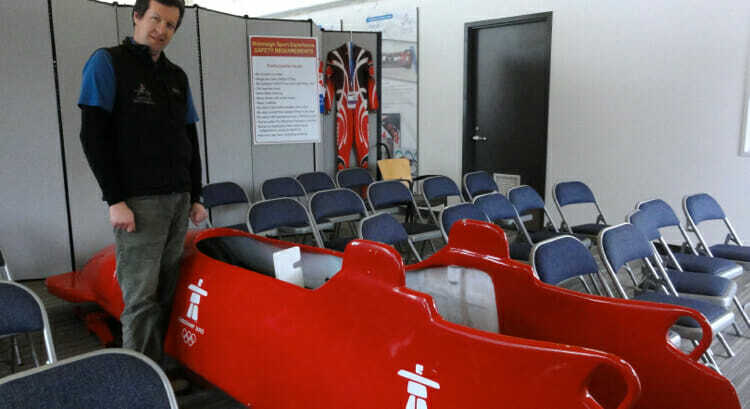 I was thinking about this as I prepared for my 42-second bobsleigh run at The Whistler Sliding Centre. What would this run mean to my life? I have a few thoughts on this subject. But first, here’s how the afternoon played out. 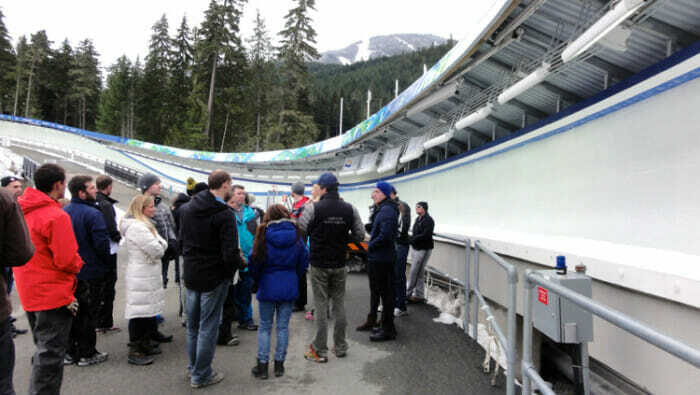 Philippe manages The Whistler Sliding Centre. He’s standing in front of a demo sled in the briefing room where everyone would learn how to take the course. He took extra time with me in advance to explain everything and quell my nerves. 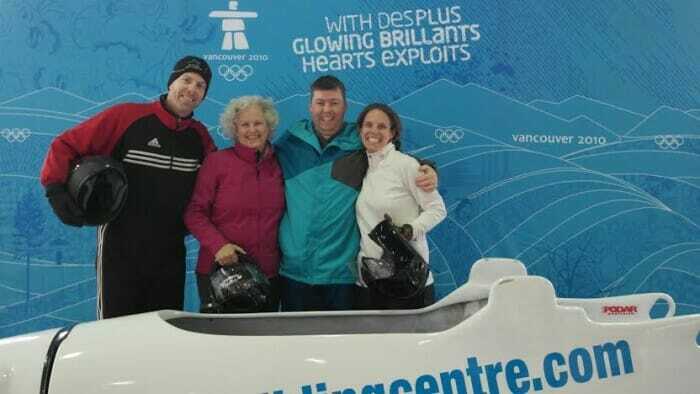 Before going on the bobsleigh I had a few days in Whistler Blackcomb thanks to American Express and Whistler Blackcomb. 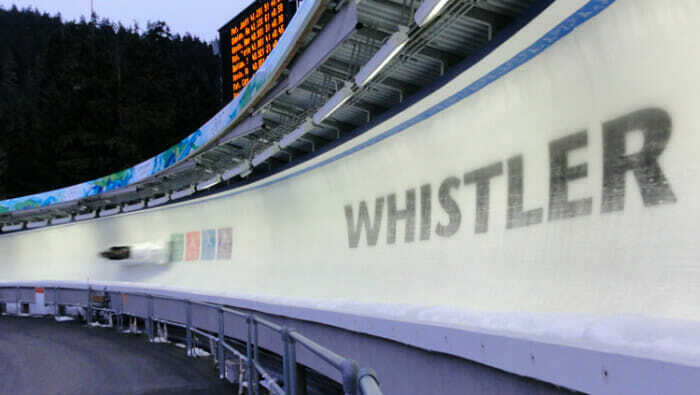 (See last week’s 32 Tips for Whistler Blackcomb post here.) 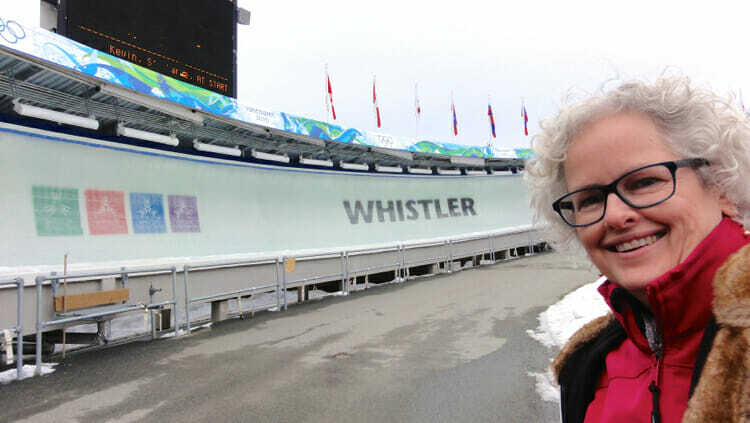 I mentioned to a number of people that I would be taking the bobsleigh run on Wednesday and received comments that included words like crazy, adrenaline rush, g-force. These words don’t usually apply to anything I do. I hike on gentle trails. I ski on blue runs. When it comes to physical activities, I am not a daredevil. So the morning before going to the Sliding Centre I got a case of nerves. I wasn’t sure I would do it. I went to the Centre as scheduled but arrived saying I didn’t think I would go on the run. Ah, but I was not the first anxious person they’d encountered. They knew how to handle me and, before I knew it I was encouraged by everyone there and was taken on a private tour of the sleigh and how it all happens by Philippe, the Centre’s manager. Assured that it was not roller coaster scary, promised that no one had ever been sick on the run, convinced that it was completely safe given all the precautions taken, I decided to go. I sent out an instagram/tweet and was committed. This is the track. They start public runs at the 7th corner so that the speed doesn’t get above 125km/hr and the g-force no greater than 4. Still – yikes! There were about 35 people there for the afternoon bobsleigh runs. We all signed our waivers after which we were measured (height and weight) and fitted for a helmet. Then it was into the training room. The sleighs are 4-man – a pilot and three other people. The pilot is experienced, the rest of us, well, not so much. Philippe informed me that I would be on the first sled in the second position. He told me it’s called the ‘champagne’ position because it’s the easiest. That seems to be just a nice story as I can’t find any reference to the champagne position on the Internet. This is the bobsleigh I was in. We reached 125km/hr at this point which is the last turn. Testing my limits is not something I do often. Yes, traveling alone does test one’s limits but for many readers, those of us who have been traveling solo for a long time, it doesn’t really put us outside our comfort zones. The bobsleigh run did that for me. We all walked down from the training center to the 16th turn. That’s the one in the photo below. At this point in a run, the sled is going at 125km/hr with a g-force of 4. From the 16th turn, a van transports groups of six up to the 7th turn where we would start our runs. So, as was the plan, I was in the first sled down – a strategic decision on Philippe’s part so that I wouldn’t witness the speed of the other sleds and chicken out. When we got to the starting point there was a fellow to help us on with our helmets and get us into the sled. Once the three of us were in, Kevin, our pilot, jumped in immediately in front of me. I sat up straight. I hunched my shoulders up to my ears. I heard the announcer on the loudspeaker (they replicated a race as much as possible) and then we were pushed off. There was a large group of us. Three went in each bobsleigh with a pilot. Here, from Philippe, we’re getting more of a good look at the course and a better idea of what it will be like. The buildup was slow. We moved down the ice at a good pace but nothing too dramatic. Then, we picked up speed and as we did we came at the turns more quickly. Banking left. Banking right. Flattening out and then on the curves again. By the time we hit turn 16 we were indeed going at a crazy speed but by then, I knew that it was over. We had a long run upwards on the last part of the track to slow the sled down and then we were caught so that we could all get out of the sled. I had done it. I had, however, broken the only important rule I had to follow – my head had bounced off our pilot, Kevin, many times during the run due to the g-force. But, I wasn’t scared. It was not terrifying. It was satisfying. I had done what I thought I couldn’t do. With help from two big guys on either side of me, I managed to get out of the sled. 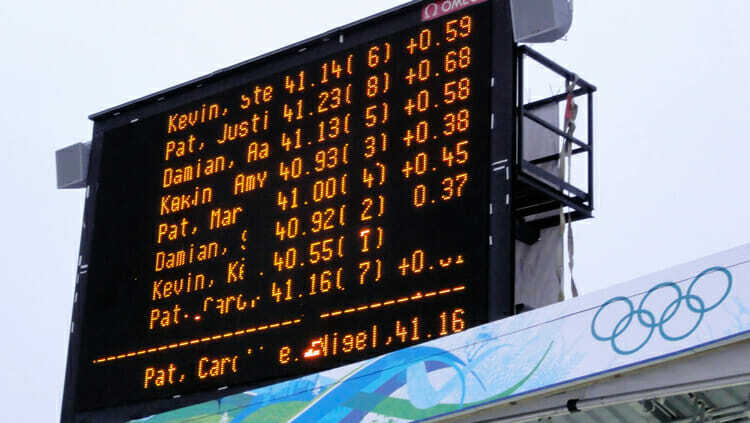 The score board shows the results of each of the teams down that afternoon. Well, in a sense, it did. Life is about stretching oneself. Learning more. Trying harder. It’s about discovery – whether that happens on a cushion meditating or on a toboggan with rails going down a steep, narrow, twisty hill made of ice. In the 42 seconds on the bobsleigh run I learned that I can do things I never, ever thought I could do. My thanks to American Express (the official card of Whistler Blackcomb) and Whistler Blackcomb. While they supported this trip, the choice of stories from the trip, the perspectives, and the enthusiasm are purely my own. Yes, I was smiling after the run. Below is the video of my run. You can see me in the small screen and the course in the large is the track. Start at 1 minute 20 seconds to see the actual run. 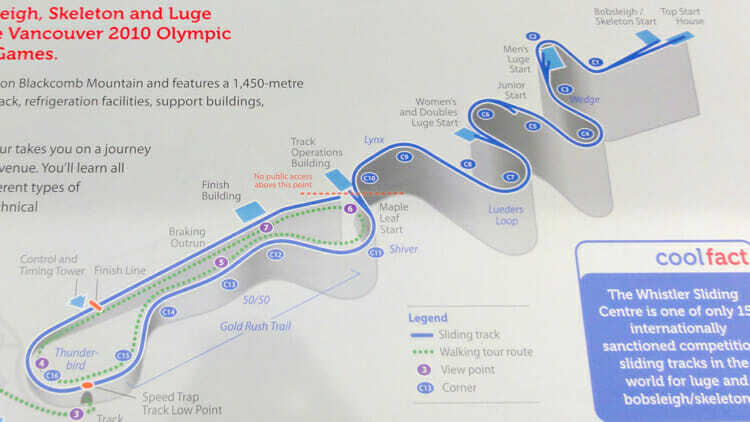 Before that is information on Whistler Sliding Centre.